Curious about the Best Gaming Themes for WordPress? We have hand-picked the best of fully Responsive Gaming WordPress Themes for our viewers. If you are looking to build yourself a Gaming Blog, Gaming Portal, Android Apk Website, Gaming News Website or any kind of Gaming Related Website then you should continue reading this post because you are going to look at some of the Best Selling Gaming WordPress Themes of modern times. WordPress is able to create literally any kind of site you want, if you wish to create a Games Selling Website? Yes you can. Want to build a Gaming Reviews Website? Now you can. Its all because of the powerful WordPress themes that are available online. There are thousands upon thousands of good quality themes and today we are going to look at 17+ of the Best Responsive Gaming Themes. We collected these WordPress Themes from all around the internet, as these are, Secure, SEO optimized, Mobile Friendly and have all the bells and whistles you might want on a gaming site. You can customize each and every element of the theme, and you also don’t need to worry about quality because these themes were created by some of the most respectable theme developers out there. So let’s jump right in…. Gameleon is your best option if you’re looking to create your own online games site. It comes with a magazine layout, too. Features include: unlimited color styles, MyArcadePlugin compatibility, BuddyPress compatibility, premium Slider Revolution plugin (worth $15), premium Notification Bar Pro plugin (worth $21), advanced admin panel, and much more. Perfect gaming news portal with newsletter subscription, blog and twitter sections to show the latest posts and tweets. Everything built into this gaming template gives visitor immersive gaming experience. Kappa is the best game blogging WordPress theme for creating a game reviews website, highlight the latest gaming news. GameZone is a lovely WordPress theme for gaming related personal web pages. Its fully loaded with lots of useful features like custom widgets, feedback form, slider, video supporting and many other. Game Box is a Fully Editable yet elegant WordPress Gaming magazine theme. Its a perfect theme for Gaming portals and Gaming blogs. Game Box can give your website a fresh look with custom colors, plus is has theme Options Panel so you can have full control over the content. LeetPress is a WordPress gaming theme with all the features you need to create a great gaming site, such as reviews, videos and screenshots. You can take a look at the video below to see how easy it is to create reviews. LeetPress also comes with 7 other help videos that will guide you through the theme. Gaming freak? Got the story (and the game) before anyone else? Want to share your passion with others? Why don’t you run a gaming reviews site? eGamer is an awesome theme, it was designed with video game related blogs in mind, however, it can be adapted to any niche. This theme has advanced features, it includes a custom author review system, video embedding (from video sites such as youtube,vimeo), thumbnail resizing, and much more. eGamer also gives users control over many of the themes functions making it an ideal theme it can easily handle the banner ads, recent reviews section, recent video section, popular/random articles section, and post-page thumbnails. You can also choose between layouts and can switch between the default magazine style layout and a more basic blog style design. TheSource is a Magazine-style theme that combines flashiness with sophistication. The goal behind this theme was to create a design that could display loads of content in an organized and visually pleasing manner. The three-column grid gives you increased control over your layout, and the full-width homepage slider creates a visual impact that is sure to pique your visitor’s interest. ReviewIt is a WordPress and BuddyPress theme that provides you with powerful review and community features. A really gorgeous and crisp looking news WordPress theme, best suited for your technology reviews magazine or blog. Score is a WordPress and BuddyPress theme that is ideal for reviewing any kind of content. Don’t retreat from the game. Instead, defeat the enemy with the breathtaking design of your game news website! If you are seeking a unique look for your website, look no further – use the Game News theme and make an impression. Valor is a Gamers theme. This theme will cater to sites dealing with Game news updates, previews, reviews etc. This is powerful with options like Custom post types, Custom background, Custom menu, Custom taxonomy, Metaboxes, Theme options etc. This theme supports 3 different post types. 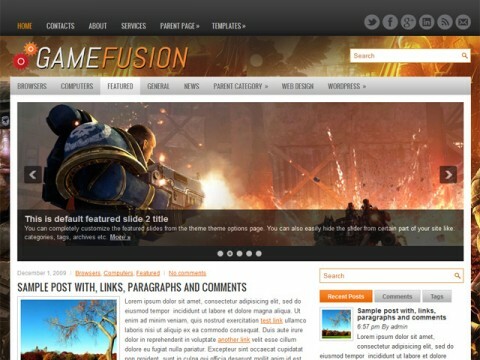 One of the most user friendly gaming themes out there, GameFusion is compatible with the latest version of WordPress including the custom menu and background features. These were the 17 Best WordPress Gaming Themes that you’ll find online. Did you find these themes useful? Tell us in the comments and please share this list with your friends. here frequently. I’m quite sure I will learn many new stuff right here! very nice list man, im gonna try the second one. Nice list. I have been shopping around for a good theme. It is for a small group of friends right now. I’ve recently started using WordPress and ‘trying’ to get the included twentyfourteen theme to work but I’m not completely happy with it. Any here you’d recommend over another if I was adding a forum? I am coming from a phpBB site and I just want more flexibility to add stuff. Jarith recently posted…Naxxramas has been released! Hi, I have not been able to find any docs in the theme folder I downloaded. I’ve tried contacting support through the ticket system on Themefuse but I’ve only received one response in almost 2 days and that only told me what I already knew that the server was offline and they apologized. I am hoping that the server issue would be resolved soon and you get all the documentation and related stuff. They recently changed their website so it might have to do something with that. Amazing themes. All that I need to do now is find a great hostings provider. It’s in reality a nice and helpful piece of info. I am satisfied that you shared this helpful info with us. I have been looking into some new themes but I really think some of these are a little overkill. Sometimes with a theme, you want it to be as simple as possible and not full of features that you will never use as this can cause an impact on your site. I will consider one or two of them however as they do look quite polished, thanks.